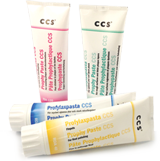 Prophy Paste CCS® is second to none in performance, handling & dispensing. The unique non-splattering, homogeneous formula does not dry out, liquefy or separate. Thick layers of plaque and stains are easily removed leaving a fresh and smooth minty sensation after each treatment. Packed in easy to dispense, color coded tubes and single disposable cups. Available in 4 different grits from coarse to extra fine. Contains 0.1% fluoride. 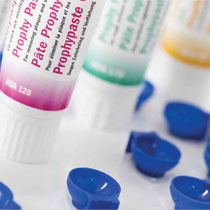 Prophy Paste PRO is a new universal paste. 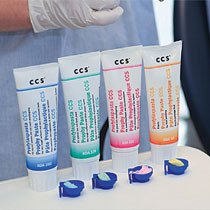 Same features as Prophy Paste CCS but in a single universal paste that is used for stain removal and final polishing. One-step prophy paste for outstanding cleaning & polishing results that offers decreased treatment time. Available in tube or single dose. Prophy Angles. Disposable prophy angles in polycarbonate with soft, flexible 100% lates-free cup for low speed prophy attachment handpieces. Ergonomic shape. Prophy Cups. 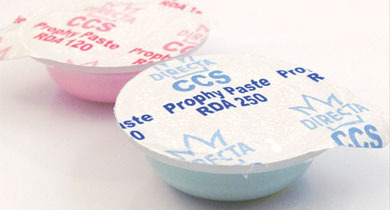 Exlusive lates-free prophy cup with outstanding paste holding, interproximal cleaning and subgingival access properties. Packaged in tube of 60ml. Packaged in box of 144 (2g) cups. New universal paste. The same paste is used for stain removal and final polishing. Outstanding cleaning and polishing results in decreased treatment time. Available in Tube of 60ml or Single Dose of 144pcs. Disposable prophy angles in polycarbonate with soft, flexible 100% latex-free cup for low speed prophy attachment handpieces. Ergonomic shape. Packaged in box of 144 (individually wrapped). Exclusive lates-free prophy cup with outstanding paste holding, interproximal cleaning and subgingival access properties. Available in latch or screw type. Packaged in box of 144.